Pete provides a number of CPD training courses. See below for a list of courses and content. PDFs of course content and aims can be downloaded. All CPD courses are designed and delivered by Pete Moorhouse. CPD Training sessions are available as half day/ full day/ twilight as part of INSET and are also available on Saturdays for PVI settings. All training’s have clear aims with desired outcomes, and are designed to have a clear impact on practice. The need to address disadvantage is integral to all of the training sessions. CPD’s adhere to the guidelines in the Department of Education’s Standard for teachers’ professional development. Impact of CPD delivery is reviewed and evaluated. Most CPD’s are booked directly by LA’s or schools however I offer some open training dates available to everyone. Open training dates for 2018. This course is designed to develop understanding of what creativity means and explore ways in which we can best encourage creativity. We will start by defining creativity and critical thinking and then looking at the different aspects of children’s thinking that contribute to the process of developing ideas. I will emphasise the importance of creativity as a fundamental skill that not only impacts on all areas of learning but also impacts on young children’s long term outcomes to become resourceful and resilient adults. We will look at EYFS and see how creativity fits within the characteristics of effective learning and how it embraces all areas of learning. The training will explore the many factors that contribute to children’s creative and critical thinking, from the impact of the environment to working together with parents. We will look at the role of the teacher in extending their thinking by looking at sustained shared thinking practice and how best to interact with children during the creative process. We will also consider ways in which we can monitor children’s creative progression especially in relation to their developing thinking skills. The Reggio Emilia approach is a world renowned educational philosophy originating from the preschools of Reggio Emilia in Northern Italy and was inspired by Loris Malaguzzi following the Second World War. Central to the philosophy is the importance of creativity and developing the child as a confident independent thinker. The Reggio approach is a body of pedagogical thought and practice – the result of many years of commitment to young children and their families and pedagogy builds on many previous educators such as Froebel, Dewey and Vygotsky. There are several aspects of the Reggio early years school system that stand out. Central is a powerful image of the child – strong, competent, and naturally curious about the world and capable of constructing their own learning. Relationships are valued with children, teachers and parents seen as being equally important. There is much emphasis placed on developing children’s creativity and the importance of the environment to facilitate this. The impact that the environment can have on learning, development and creativity is profound. We will look at the aspects of the environment that play a part in encouraging creativity and wellbeing. We will look at the influence of other pedagogies which have influenced current practice focusing on Reggio Emilia. 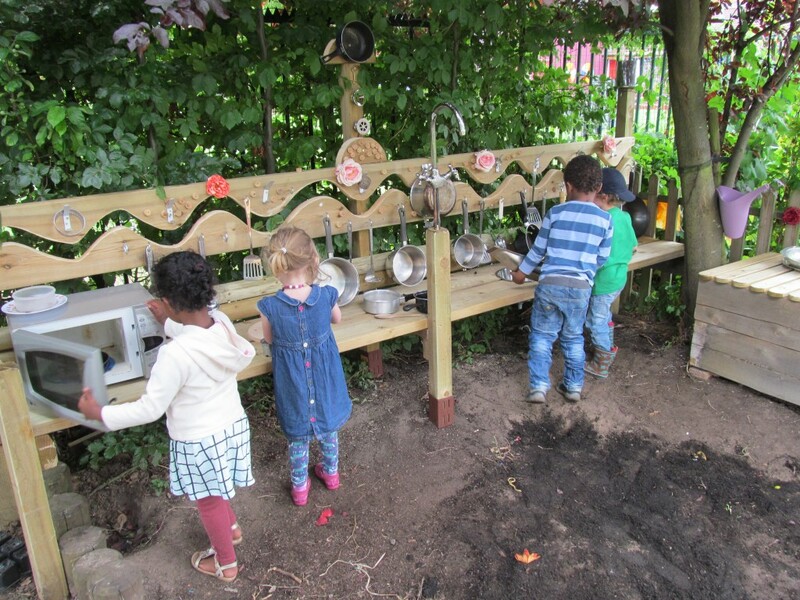 In the Reggio Emilia approach they refer to the environment as the Third Teacher – showing the importance they place on creating the right environment for learning and growth and for children to construct their own learning. We will look at an in-depth environment audit – a resource that could be used to evaluate your current learning environment and plan for possible improvements. We will consider the many elements that contribute to creating an outstanding environment from aesthetics, access to intelligent materials, opportunities for inquiry based learning to environmental factors and sustainability. We will discover how the environment impacts on wellbeing and learning dispositions. The session will also encourage an approach whereby the outdoor environment is seen as equally important to the indoor environment in providing rich learning opportunities. Photography is a powerful tool for communication and creative expression. It is an extremely versatile medium. It is visual but it often becomes more about language – as it has so much capacity to stimulate and open up dialogue by allowing children to express their thoughts and their way of seeing the world – encouraging children’s voice. 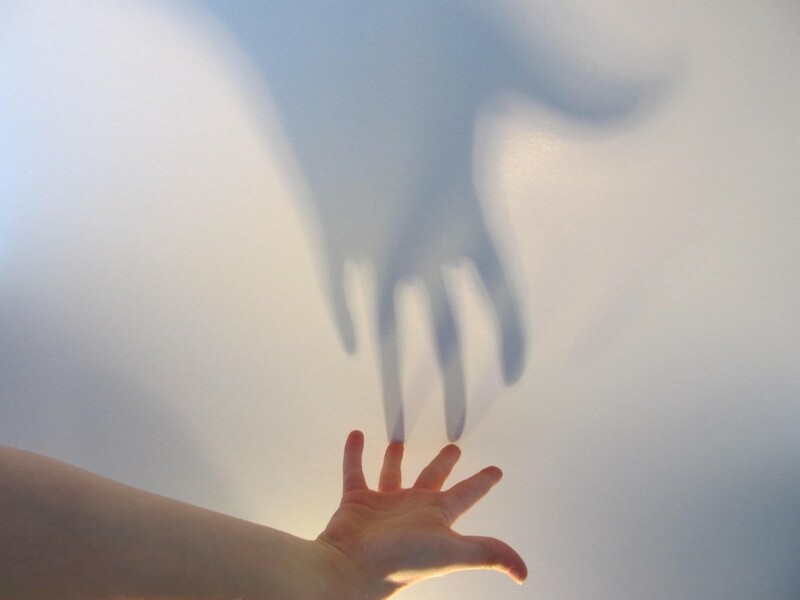 For the practitioner it gives a unique insight into the children’s interests, the way the child sees their environment, friends, learning etc. Children use cameras in creative ways – unrestricted by convention – being so direct and curious and the results can be profound with the images being the starting point for further exploration. The children’s use of cameras puts them at the center of their learning – they can use the camera to document their investigations – creating their own learning stories. The images provide a wonderful way to reflect on learning and help evaluate. 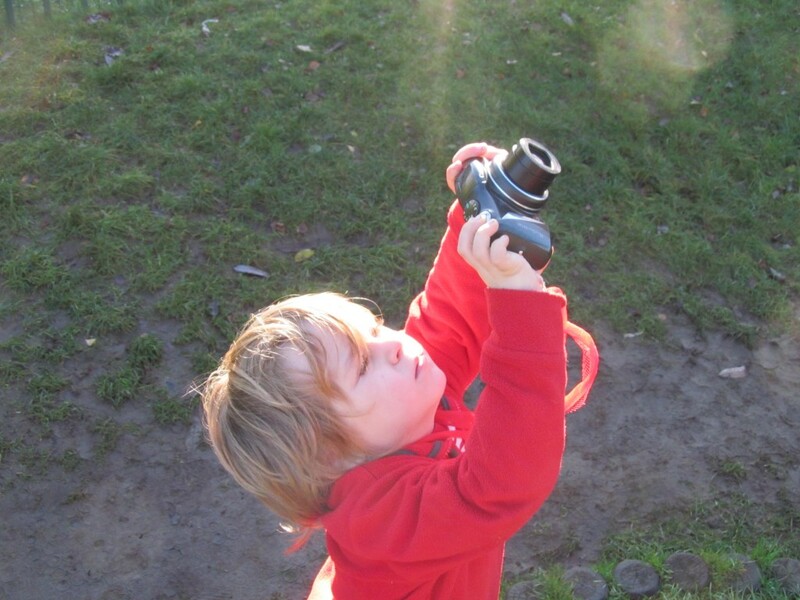 Photography can support all areas of children’s research and exploration in this way and when children document their own work they are more engaged with the images and gain a deeper understanding of their own learning process. We will look at the use of photography as a way of consulting with children and understand how photography can be used as a tool for self-evaluation. Photography can also be using to support story telling. Images can be taken to illustrate the story, stimulate conversation and provide a starting point. Children acting out a story can be photographed, again providing a way to revisit and reflect on the story. Photography can be seen to embrace all areas of the EYFS and characteristics of effective learning. I believe there should be a children’s camera in every classroom as an important resource with which children can support and construct their learning. There will be information about the practicalities, best cameras for children, reviewing images, storage, software and how to successfully introduce photography to young children. There will also be a practical activities so do bring a camera or smart phone if you can! Using photography as a way of consulting with children. Learn about practicalities: best cameras for children, reviewing images, storage, and software. This workshop looks at the value of using intelligent materials – objects that children can use in a multitude of different ways, exploring different possibilities, to express their imagination. Combining natural or recycled materials, the child is at the center of their learning as they use their imagination to create various arrangements/constructions/narratives as they combine the objects. 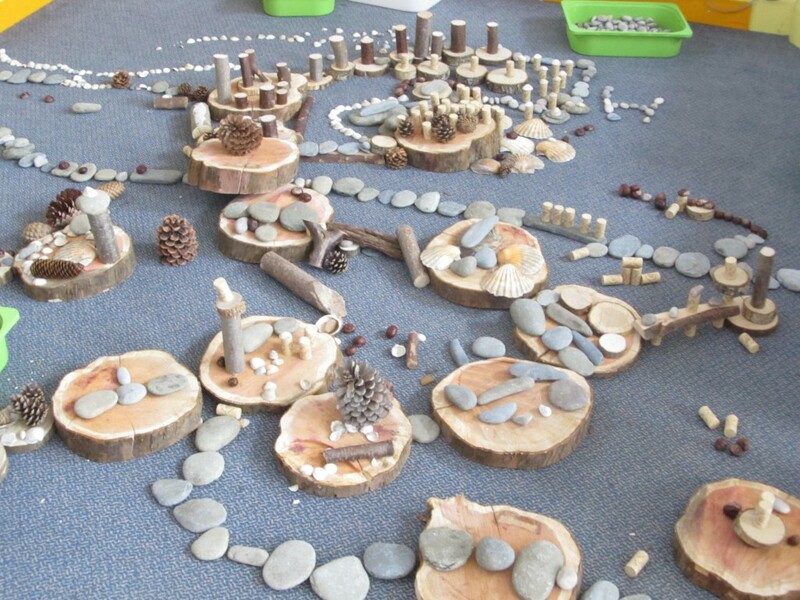 Materials are explored in many ways, following the child’s line of enquiry but with the practitioner sharing their journey of discovery – researching and learning together. The exploration of materials encourages open-ended discovery and a focus on process. Natural and recycled materials can be seen as intelligent materials offering many possibilities for exploration and associated learning. 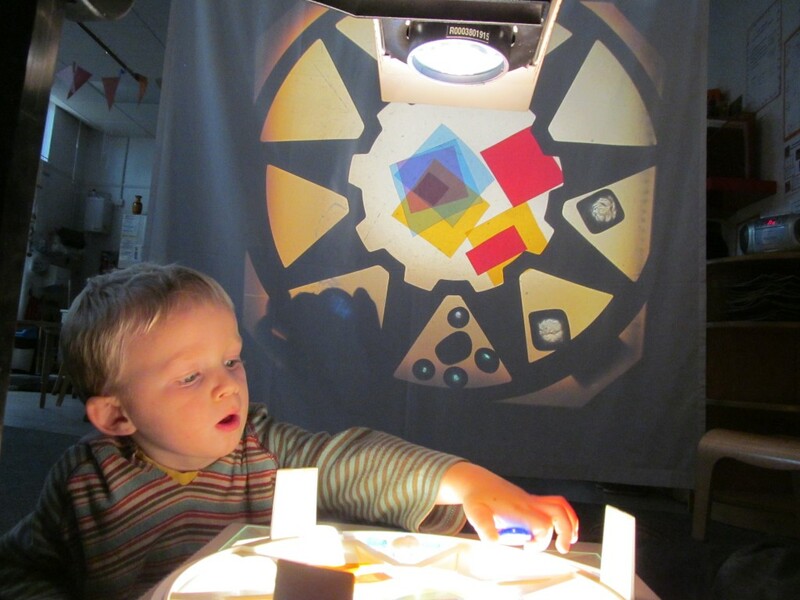 Creativity and curiosity underline children’s emergent thinking and development. We will look at examples from Reggio Emilia which has had a long tradition of working with natural and recycled materials and gain insights from Frobel (gifts), Nicholson (loose parts) and Goldschmeid (Heuristic play). We will look at how placing and arranging meets many learning and development aspects of the EYFS. The workshop will look at ways in which intelligent materials can be incorporated and developed in early years settings. 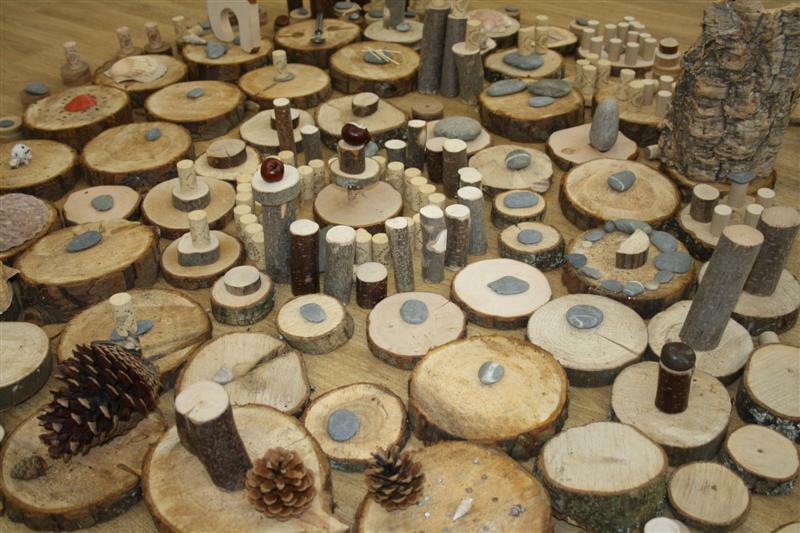 We will look at example of loose parts indoors and in the outdoor environment. Practical session for practitioners to explore a selection of materials, gain confidence and share the experience of making creations. Block play is well established as a rich resource with which to develop children’s imaginative play, self-expression and creativity. 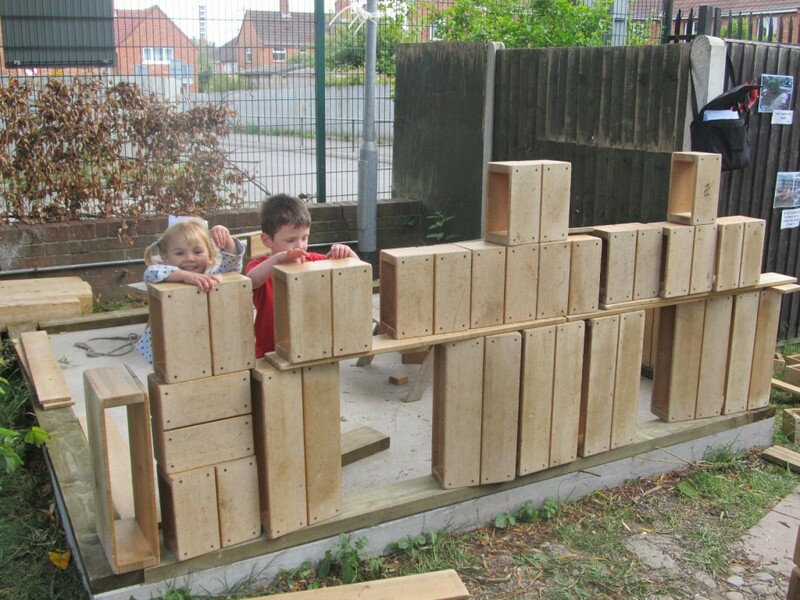 Block play is open-ended which allow children a multitude of different ways to express their imagination. 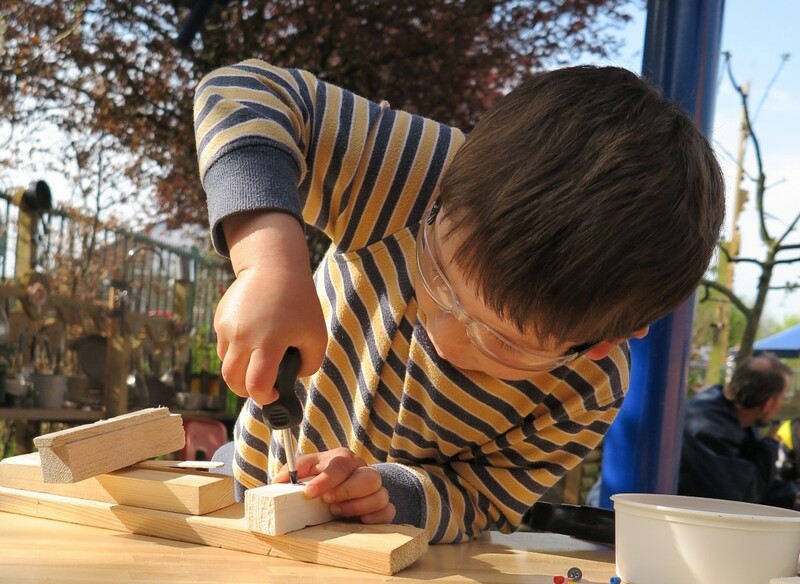 Block play incorporates many EYFS areas of Learning and Development and incorporates the Characteristic of Effective Learning so it really can be seen to be a resource that is central to curriculum. Blocks are a really popular resource for young children and they typically show high levels of engagement for extended periods of time. The hands on experience of block play develops children’s mathematical and scientific thinking as they explore spatial relationships, balance and construction techniques. Large block play can encourage communication and collaborative work due to the scale of the work whereas smaller blocks can facilitate individual expression. Physical development is also developed, as children become more dexterous, exploring balance is various ways and using a range of movements. Blocks play can also provide opportunities to problem solve as children work out how to best use the block to express their ideas. Blocks allow children to be independent and construct their own learning. Children become engineers as they construct bridges, architects as they design houses, artists and designers as they create sculptures and arrange patterns. Children create a vast range of constructions from making cars to boats and petrol stations…..the list is endless. 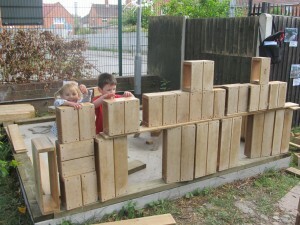 Block play allows us amazing opportunities to observe children, giving us a real insight into their thinking processes. Working three dimensionally is another important aspect of play and an area which can unlock some children’s learning as they create structures and construct narratives. The workshop will explore the origins of block play, looking at Frobel’s gifts and theory of “loose parts” (Nicholson). I will provide examples of blocks and refer to the wonderful contribution that Community Playthings have made to this important area of learning with their different series of blocks – unit blocks and hollow blocks and the new all-weather outlast blocks. The session will include a practical session. This course is designed to deepen practitioner knowledge of the Characteristics of Effective Learning, focusing on the process of how young children learn. The Characteristics of Effective learning are fundamental to every child in becoming a lifelong learner. This workshop aims to raise their profile, to gain insights in current thinking and to propose new ways in which we can monitor children’s progression in this vital area. We will look at Playing and Exploring: looking at how we support each child as a unique individual, how we encourage independence and how we encourage children to construct their own learning through play by following their own curiosity and lines of interest. Active Learning: We will think about dispositions for learning, motivation for learning and engagement – looking at the Leuven scales of involvement and well-being. In terms of persistence we will look at the work of Dweck in terms of growth/fixed mind-set. With Creating and Thinking Critically we will focus on creative and critical thinking as a process, I will emphasise the importance of creativity as a fundamental life skill that impacts on all areas of learning and also impacts on young children’s long term outcomes to become resourceful and resilient adults. The workshop will focus on the practitioner’s role in fostering creative and critical thinking skills. The workshop will consider ways in which we can monitor children’s progression of the characteristics especially in relation to their developing thinking skills. There will also be an opportunity to reflect upon values and how these relate to the Characteristic of Effective learning especially in terms of our view of children and their ability to construct their own learning.